This heavenly 2 bedroom plus loft, 3 bath unit is just blocks from all dining, shopping, and everything that Main Street has to offer. Guests can ski in to the complex and either take a short walk to the gondola or jump on the shuttle to get to the slopes. 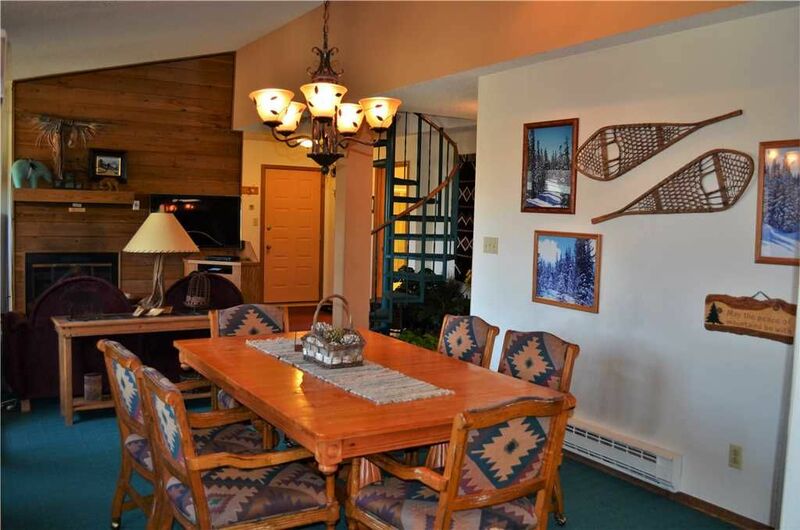 This condo has fantastic views and due to its amazing location it is great for any type of Breckenridge Vacation! The master bedroom located on the main floor has a king sized bed and private bath. There is a full bath off the entry way and the living room. This unit has a private deck off the dining room and a full kitchen. The second bedroom is upstairs with a queen size bed and the loft has two sets of bunk beds. All of the in house entertainment is taken care of with the unit being equipped with 3 TV/DVDs within the condo. Square Feet 1329. Thank you for your review we are so glad you enjoyed your stay! Please contact Wood Winds again for a repeat customer discount. This place has a great location. Just a few minute walk to the gondola, and an even shorter walk back from the slopes. It is only 2 blocks from downtown and all of the bars and restaurants. The heat was off and on one day, but the house is well furnished, and has a monopoly to ensure plenty of family fights. Good times, and thanks.